Any of these canvas prints will help turn your room into a stylish home! 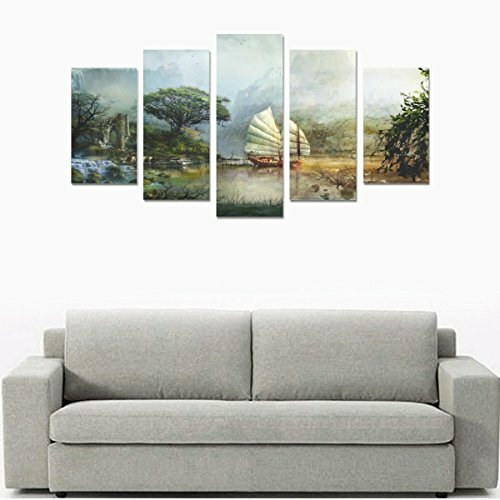 A perfect wall canvas print can be used for living room, bedroom, kitchen, hotel, restaurant, office, bar and other home decor, 5 Piece Oil Paintings on Canvas (No Frame) Works well with the palette of various carpet furniture and any other home decor accessories.Made of high quality 100% canvas.The picture is only for reference, please make the object as the standard.Suspension effect depends on the size what you choose and image. 100% Canvas, Painting size: 20x35cm 2 pcs, 20x45cm 2 pcs, 20x55cm 1 pc.one-side printing.Non-waterproof. High-quality canvas-printed provide long-lasting fade-resistant UV file inks and long-lasting canvas prints. A perfect canvas print for the wall can be used for living room, bedroom, kitchen, hotel, restaurant, office, bar and other home decoration. If you have any questions about this product by Personalized Canvas Printing, contact us by completing and submitting the form below. If you are looking for a specif part number, please include it with your message.